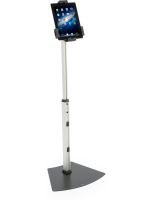 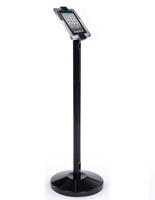 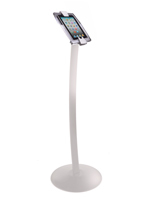 This adjustable height iPad mini stand is a great choice for businesses and homes alike. The easy to use fixture features a stand height that can be set to between 38" and 66" for maximum usability. 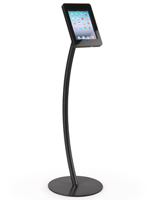 A variable height iPad mini stand is perfect for creating tablet displays that match content. 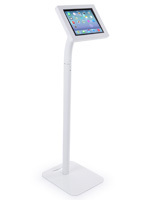 This type of enclosure is great for watching movies or reading while seated or showcasing interactive content to passersby and customers alike. 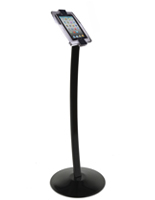 The black finish iPad mini stand is made from durable steel and features a clear acrylic device enclosure. 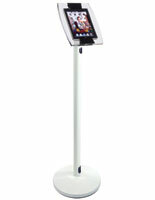 Depending on how the Apple tablet is inserted, Home button functions can be hidden or left exposed.